Main Features of Plug2Sync and Backup. Sync files and default folders. Bidirectional file synchronization. Bidirectional file synchronization is also known as symmetric file synchronization or file mirroring. Any file or folder modification such as creation, deletion or any other changes in the mirrored folder will be detected automatically. All changes on the PC or removable storage device will be exactly replicated. Sync files and default Windows folders using USB drive or any other removable storage device. Backup files. Automatic file backup. Easy access. Plug2Sync and Backup will automatically analyze, synchronize and back up your e-mails, precious photos, contacts, tasks, MP3s, documents or other files of your choice. Sync and backup files to removable hard disk, memory card or USB flash drive. For easy access, your data is replicated to external memory device in the original file format and can be opened directly without Plug2Sync and Backup. Automatic file backup. Convenient (Drop-Box like) Storage for easy file access. Have the latest copies of your files anywhere. It works similarly to Drop-Box and the Internet connection is not required. Select the folders for synchronization and the contents will be automatically synchronized with the removable device as soon you plug it in. You will be able to access the latest copy of your files on the USB device anywhere. Transfer or synchronize documents and media files between PCs. Sync your office documents, PowerPoint presentations, Word and Excel files. Sync music and video to a wide range of portable devices recognized by Windows as an external drive. Sync pictures, photos and images. Transfer video from one computer to another. Sync on connect or manually - Sync Files and Folders Using USB Drive or any other removable storage device. "Sync on connect" feature to automatically sync when a USB drive is plugged in. Plug your USB device in and Plug2Sync and Backup will automatically recognize it. Start your first synchronization in a few clicks. Once you set sync up, next time just reconnect the device and it will sync automatically in the background. Plug2Sync and Backup works with a wide range of removable devices, such as USB drives, SD cards, memory sticks, external hard drives, flash memory cards or smartphones. When external device is connected, sync your files and folders whenever you want, in a few clicks. Selective sync. Select only data that you want to synchronize. Select the default files and folders that you would like to synchronize. Exclude and Include Filters. Select the Outlook folders that you want to share or synchronize or sync entire .PST files. Sync Favorites and bookmarks between computers. Sync favorites from Internet Explorer between PCs or back up the Favorites folder. Synchronize any bookmarks between computers or back them up automatically. 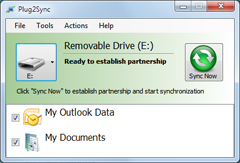 Plug2Sync and Backup is compatible with Windows 8, Windows 7 32-bit and 64-bit, Vista and Windows XP. Compatible with Microsoft Outlook 2010 32-bit and 64-bit, Outlook 2007, Outlook 2003 and 2002.